This week, my menu planning is especially important. My mom is coming up for the week to take care of the munchkins and taxi them to and fro in their activities. She will most likely be doing most of the supper preparations, too, so I wanted to have a plan and be ready for her when she gets here. I’ve made my menu, done (most of) my shopping, and all that is left is the cooking. Saturday will most likely be leftovers or whatever we didn’t cook earlier in the week. How about you? 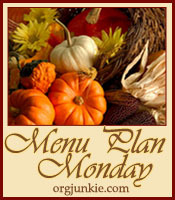 Have you made your menu plans for the week? Hop on over to orgjunkie.com for some more great menu ideas. MMMM sounds good. So nice of your mom to come up. Bet the kids LOVE having Grandma around. 🙂 I hope you have a good week in class!